The bond between you and your dog is special. Through positive reinforcement training, this bond between you and your dog can become stronger. Paws College can help you and your dog forge this special bond through our unique positive reinforcement coaching programs. Unlike most training programs, our philosophy is based on coaching both you and your dog to better communicate with each other so that both of you can achieve optimal and mutually satisfying training results. The founder, Principal and Head Coach of Paws College is David Cull. David comes from a background of more than 20 years in the education industry, specialising in early childhood and learning support education. In addition, David has also owned and trained dogs for many years. 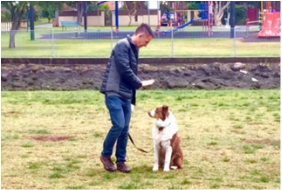 His prize winning Australian Shepherd, Disco, has won many prizes for her unique tricks and is well-known in their home suburb of Balmain. 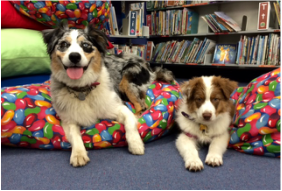 David has completed the Statement of Attainment in Dog Training (SOADT) under renowned trainers Steve and Vicki Austin and volunteers his time with the Leichhardt Dog Training Club. Starting from sit and stay, loose lead walking and moving through a variety of dog obedience tasks, including recall and basic tricks. Learn how to socialize your new addition to your family. You and your dog will gain increased skills in obedience training. You will learn how to achieve a greater drive and focus in training. Off lead work is introduced as well as tasks, which increase distractions, duration and distance. Want to impress your friends and family or just making sure your dog is stimulated? More advanced skills as well as more off lead work and tricks. Individualised programs and behavioural training programs also available.